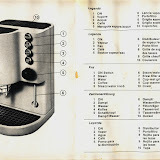 Apparently I have one of the few entire copies of the instruction manual for the venerable Faema Family espresso machine - I have had a request for a copy already and then heard about another one today - I have scanned the manual and placed the images in my web album. If you have a Faema Family and no manual - now you can access this version. I'll eventually convert to PDF and make that available. The Family is a great little machine - one of Faema's best efforts in the domestic market - a shame to see the manual and the machine no longer available. I have had a Faema Family for a year now, use it daily and love it. I have´nt had any instruction manual thou which has been frustrating. So finally I got one! I just bought a used Faema Family and it didn't came with the manual ! Thank you so much for the manual. I have been trying to find one for quite some time. Isn't the Family a great machine? No worries! Yes, the Family is pretty amazing for its age and size. I've blown the pump on mine (again - pushing it too hard) and have it open on my bench. Utterly amazing how simple it is. I'm handy and want to service my machine. It's leaking and just not pumping hard enough. Can you help with a good place to get parts and mabe a schematic or parts list? Hey all, so my father passed on his 1983 Faema Family espresso machine and grinder, it even has the bottom plate and drawers that they sit on. I am having a major issue/trouble getting the correct pour. Here >> https://www.dropbox.com/s/m02be9irrdhyh9k/Photo%20Apr%2008%2C%204%2024%2045%20PM.jpg?dl=0 is a link to the variables and notes on my pours. ALL of them tasted like hot bitter coffee and I felt like there were no oils being extracted. Zero flavor. After these pours (in the link) I switched to a new bean and found out the beans were too old. On a new shot, with new beans, I could taste some flavors. HOWEVER. Huge problem: the shot was a grind #1/9 grams/28 seconds(after it came out)/8mL volume, yikes, and took THIRTEEN seconds to even make its way out the machine. IS THERE SOMETHING WRONG WITH THE PRESSURE? is it the pump? What are some solutions? or do you think there could be a different problem? I have to crack open the boiler to replace the heating element. I also have a new steam valve gasket set to install. I'm using the Gaggia Baby back up unit in the mean time. I have had my Family machine and grinder since 1993 and has worked great. The steamer function now doesn't have enough pressure. Any idea's on what might be the problem? Well, you've had the machine a good while, and I for it to be functioning well I'd have to assume you've been taking care of it - this would include de-scaling the boiler by using citric acid or vinegar. When you descale, do you run some of the liquid through the steam wand? It may be that there is a certain level of 'artereosclerosis' of the machine's pipes. When was the last time the machine was serviced? The boiler itself may have accumulated a lot of muck over the years that is settling around outlet points and reducing the flow of steam, or the boiler might not be heating the water sufficiently to generate a good pressure. Thanks a million for the manual. Anyone know where to find portofilters (handle, body, spout, basket, etc...) for the Faema Family? Are there 3rd party manufacturers for this part? Has anyone tried bottomless portofilters on the FF? Thanks again. No worries about the manual - as for parts, yes parts are available and depending on where you are they can be acquired fairly quickly. In Australia most the parts can be sourced from Coffeeparts.com. The group handle and baskets are fairly standard 58 mm commercial style parts and you may find that group handles made for other machines fit the Faema just fine. Oh! The Ascaso Steel espresson machine is essentially the same as the Faema Family but in a new case - most parts for the Ascaso should fit the Faema as well. those pics are obscenely amazing. That's coming out of a Faema FAMILY and La Marzocco naked PF? wow. Excuse my ignorance: does the FF belong to E61 Group or ECM (& what does ECM mean)? I'm trying to get a PF for my Faema Family from Espressoparts.com, and they said they couldn't help me. A very helpful manual, thanks. I've been looking for a tamper to use with my Faema Family. Do you know what size would fit its portafilter? Martin - a 58 mm tamper should fit. Mine is 58.5 mm but it was tailor made for the basket. Generally though, any 58mm tamper should work for you. If you are going tamper shopping, take one of your filter baskets so that you can check for fit. I'm not in Australia, but I wish I was today. I'm in Calgary, Canada. It's minus 37 C with the wind chill here. I found a place that sells the Reg Barber tamper (they are made in Canada) and later will brave the snow and go get one, with my portafilter in hand. I have a Faema Family and was wondering what the water button is for? I've read the manual but it doesn't really explain when it should be used and for how long. I assume the water comes out of the steam stick? Thus you need to turn the knob to let the water out?? That is correct - the water button should activate the pump to push hot water through the steam wand for tea or additional hot water for a long black. It is, however, a painfully slow process and I generally just boiled the kettle when I wanted extra hot water. I just received a used Faema Family Espresso machine and the Faema Family coffee grinder, without any manuel...without your on-line owner's manuel, my first coffee would not have been so good! You are quite welcome - enjoy the Faema, it is a beautiful little machine. Please don't hesitate to email if you have any problems with her. Thanks for the coffee machine manual. Do you also have the manual pages for the grinder? Can you please upload those as well - it will be greatly appreciated. Many thanx for the manual. I had inherited a Faema Family which was working well. Unfortunately I was using it before consulting the manual and it appears the pump will not prime the water. I think I changed from the steam button to the coffee button without flushing the water out as per the manual. Now the unit just "buzzes" and water does not come through regardless of whether I have it on steam, coffee or water. Also the steam button no longer goes off after 5 minutes. I pulled the unit apart following the first few steps of the Faema family rebuild. All the internals appeared to be OK. I have not pulled apart the pump and suspect that it may be the issue. Any suggestions would be greatly appreciated. I had a similar problem with mine. I also dismantled the pump and could see no obvious problems but I replaced the pump anyway and the machine started working again. Depending on where you live you can find this type of pump relatively easily as they are a fairly common item in domestic machines. Thank you for your prompt reply. Can you recommend a better upgrade pump or should I use the Ulka EP5 pump which I think is available from Coffeeparts.com.au. Also while I am ordering the pump, can you suggest any other worthwhile upgrades I should consider for the family - bottomless portafilter perhaps ? Does anyone know how to adjust the grind dial? That part was left out of the posted manual. I want to get the most coarse availablt. Thanks for the manual. I am trying to find out what size is the gasket (o-ring) to replace mine as the portafilter is leaking. Does anyone know and also, the best place to order from (I'm in USA). Julie, if you email me at cafe(dot)grendel@gmail(dot)com I can provide you with some further details to obtain rubber seals for the faema. Just found this site by googling "Faema Family". Am dismayed that the unit no longer is being made, because it's so great. Some commenters say to others with mechanical problems that "you must have been taking care of the machine because it's run so long." WELL--My machine is 18 years old and suddenly started leaking. Finally found a Faema repair shop who told me the gasket should be replaced annually. We used our machine regularly and have NESVER replaced a gasket; NEVER descaled it (despite hard water); NEVER replaced a pump--yet it was working perfectly until it started leaking. We didn't mean to abuse it--just didn't know maintenance procedures. So I guess it's an even better machine that people have thought, although our corroded one may not be worth saving. I have had a black Faema Family (aluminum boiler) for 18 years and it has held up very well, in spite of having to use very hard water where I live. Finally had to replace the main gasket for the PF last fall. Now it is squirting hot water out the wand when the machine is on, even without being toggled. I've taken the back and top covers off and am wondering if you might have a link to a wiring diagram so I can be sure to reassemble it correctly? Also, any pointers on cracking the boiler and reassembling it? I have a hunch that it may need a more thorough cleaning than I can do by descaling and that it might brew at a higher temperature if I can succeed in doing so. Oops, just found your post with photos at http://cafe-grendel.blogspot.com/2006/11/getting-along-faemasly.html - thanks! do I need to remove the coffee dispensing screen to get the two boiler parts apart? ARE YOU READY FOR THIS!!!!!!!!!!!!!!!! First I would like to thank you for posting the Manual. Very Appreciated. I just picked up a Faema Family in perfect working condition for $4.00 at a good will here in Sioux City, IA Not 400 dollars but four dollars, like 16 quarters, or 40 dimes, just 400 pennies. I do have a question about it though, the steamer is not anything like I can find in any picture. The steamer is a red plastic thing with a clear rubber tube connected to it. I do not get how I am suppose to steam milk with that. Maybe it is a piece used for hot water extraction, I don,t know can anyone help. I may be missing the metal steam spout. Does anyone know where I could get one? I have a Faema family unit, bought new in 1986, still going strong, also a friend also has one - no problems but small things. Thanks you for posting the manual, a great help! I am trying to adjust the grind, and not sure why but virtually un-moveable. Thanks for the manual. I have had my family for a number of years having picked it up from a garage sale for $40. If you have any pics and also model numbers that would be appreciated. I have a Faema Amica 2, the water will not stop running unless I turn it off, is this normal. Thanks. Just got a 2nd hand faema family $450! But thanks to your manual can see it doesn't work properly - steam light doesn't go off and coffee was horrible! Presume not heating properly. As a generic reply to few of these leaky steam wand questions... the units do disassemble, and usually just need a cleaning, descaling if required, and new O-rings applied. Just measure what came out, measure the od and id of the place it has to go in, and pick an o-ring that is a little chubbier to fit. Standard high temp O-rings are all you need. I don't have the dimensions, even though mine lasted for 26 years before I retired it and bought another one that was like practically new condition, I never have the steam wand leak. This is a great home espresso machine. Brass boiler only! I have a Faema Grinder circa 2005 and am looking for a manual as I replace the burr set. It could be the pressure - and running some cleaning tabs through the boiler may help with that (or even just white vinegar) however try adjusting your grind a little - and alter the pressure with which you tamp the grounds in the portafilter. A slightly more coarse grind may allow you to get a decent shot - and test this by altering the grind progressively. If even when very coarse the shot is exceedingly slow then it pay be the boiler, pump or feed lines. Hi thanks! I adjusted the grind first and it seemed to do the trick. This mornings shot came out perfect. I could really taste the guava and white sugar in this Colombian roast. Yesterday I went from #1 grind to a #2 grind and from what I recall there was a little bit of #1 left in the burr. So when I poured the "good shot" yesterday it must have been a mix of grind #1 and #2. This morning the first shot was with a grind #2 and it came out too thin at 9 grams. I turned the grind cup in between the #1 and #2 tick-mark and that seemed to do the trick at 9.5 grams. Beautiful consistency with all the right flavors. I'm definitely going to try some cleaning tablets. Any recommendations on where to get them locally? I heard Bed Bath and Beyond has some cleaning materials. Hi, we have just acquired the Faema Family - circa early 1980's with no slider button - (inherited) with no user manual - Not sure how the unit works and it just seems to make a buzzing noise with some steam. Would you please be able to pass us a copy of the user instructions as we are lacking them and the link above for instructions is no longer working. I've had a Faema Contessa/Family for a few years now, but I've only recently heard that it's possible to run a shot at espresso-brewing temp AFTER steaming milk for a cappuccino. Is this advisable? How would you go about making steamed milk drinks, order-wise? i have the Faema family machine and grinder. recently the handle that dispenses the coffee grind on my grinder has fallen out and cannot seem to get it to stay back in place. Do you have any recommendations. Also I would love to get a copy of the manual. Very easy! I just did it yesterday (what a coincidence)... My spring broke, so I just bent another loop of the spring and screwed it in place. Take your grinder off the stand if you have one. Clear all the coffee out. And flip it upside down. You will need an Allen key set. Before you flip it upside down. I like to make sure I remember what number it's at. And during the repair, I never spin the burrs because I've calibrated the grind sizes just by trial and error -- so if I lose that place. I lose all my recipes. Anyway flip it up side and there are three (3) bolts. One under the front of the grinder and two on the bottom. If you remove these, your in! It pulls apart. And that's all there really is to it. link to the manual doesn't work. any chance someone has another copy? I just got one of these from my mom-in-law. She couldn't find her book but sent me this link. It doesn't work though!! Can you update the link or repost it? Thanks! My name is Gino. I have a question for you experts. I found an early Family (1990 with Brass boiler and copper lines) for $40 CAD, grinder and all! Restored it because it was covered with cigarette stench and grease from being in an old kitchen with ZERO maintenance. Here is a link to my Dropbox folder with process photos and a video. Please watch the video in the video folder! My Problem: Water flow is way too heavy. I've replaced the gaskets, cleaned the boiler, flushed the whole system. Everything runs great! However... I can grind my beans down to baby powder and the machine will still push right through it. The water flow is very heavy! The machine gets extremely hot (steam if left on too long) and even at the finest of grinds, I will make about 2 ounces (60mL) in about 11 seconds. Hi Grendel, I am so happy that your post is still up and running after so many years. I also picked up a Faema Amica but without a manual. I tried downloading yours but the error message pops up that it is not found. Can you direct me on this please? The expresso machine works fine with one exception. When I press the cup button, both the expresso spigots and the steamer spigot run together. How do I turn off the steamer spigot?